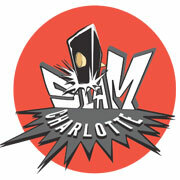 SlamCharlotte has a monthly poetry slam. This month they’re at Booth Playhouse. Three rounds of poetry and 12 poets, featuring Liz Prisley and hosted by Mr. Bluz. Winners receive cash prizes. The group is well known on the national level having won the national competition in 2007 and 2008. The national slam competition was even here in town August 2012! This event is not recommended for children due to adult language and content. Tickets are $12 and the show begins at 8 p.m. Details.